Like most of you I suppose, I spend a good deal of my personal time thinking about food. Frankly, if I am not currently eating a meal, I am likely thinking about my next meal. This means that food factors in as a topic of entertainment for me. I read books, magazines, and newspaper articles devoted to food. And, I am an avid fan of such food programming as Top Chef, Hells Kitchen, Anything on Food Network, and of course, the Next Food Network Star. Now, to be honest, this was the first year that I had watched an entire season of NFNS in full. And I must admit that it was for research more than anything else. That is because I actually tried out for the show. There, I've admitted it to the entire blog-reading world. The contestants on Next Food Network Star tend to be a little more amateur than Top Chef. Not all are even trained in professional cooking. I immediately decided that I liked Melissa D'Arabian, mostly because she was a home cook like me (I love an underdog) and as shrill as she can be, was probably the least annoying of the other contestants. I watched and cheered Melissa until the bitter end - and that was tough because I liked that Jeffrey guy too. I even watched the premiere of Melissa's own show! Of course, then I lost interest and haven't watch her since...I know, I'm so fickle! I loved the first episode. Melissa made North African Meatballs, which I think was a great way to introduce some more exotic spices into a fairly familiar dish. 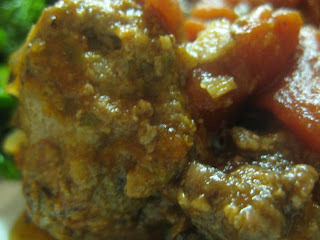 Instead of the usual tomato-basil sauce, these meatballs incorporated cinnamon, brown sugar, and olives into the mix. Even a hater of olives like myself really appreciated the brininess that they lent to the sauce (just chop them really small - they really work into the dish). If I were to do this again - I would make double the sauce, because I felt like there wasn't enough to go around for all the meatballs. 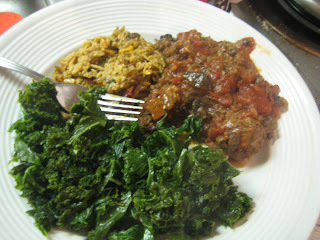 Although Melissa also included a couscous recipe, and some carrots, I decided to pair my meatballs with some ingredients I already had on-hand: brown rice and sauteed kale. You can find the recipe on the Food Network page- and it is also copied below. In a large saucepan heat the olive oil over medium heat and saute the onion and garlic until soft but not brown, about 3 minutes. Add the lemon zest and olives and cook for 1 more minute. Add the white wine, deglaze the pan, and let it reduce for a 1 to 2 minutes. Stir in the stock, canned tomatoes, sugar, red pepper flakes, and cinnamon, and simmer to blend flavors, about 7 minutes. Season with salt and pepper, to taste. To make the Meatballs: In a medium bowl, add the egg and tomato paste and stir until smooth. Add the cilantro, ginger, cumin, and cinnamon and mix until well blended. Stir in the ground beef and oats, season with salt and pepper, to taste, and combine gently after each addition. Do not overmix. Rolling with your hands, make about 32 meatballs, about 1-inch in diameter. In a large saute pan, heat 3 tablespoons vegetable oil over medium heat, and brown the meatballs in batches until golden on all sides. Add more oil, as needed. Transfer the meatballs to the pan with the sauce and let simmer for 20 minutes. Have you ever made a recipe a with weird-sounding combination of ingredients? How did it turn out? I LOVE this post. Not everyday you see an African dish featured on a food blog. Thanks so much for this. I'm always looking to try new recipes--especially from countries that aren't that famous for their food. 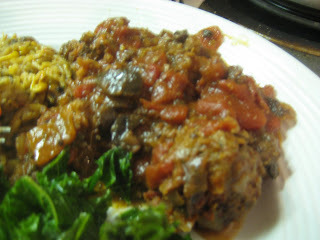 A possible post for the future could be on South African stews. A lot of their stews came from the British settlers and the South Africans eventually added local flavors and spices to make them more delicious! Thanks for the feedback and the great idea! I will definitely look into some South African stews! Anyone with recommendations please email me!